This morning I woke up excited to start the day! I didn’t have anything to do and I had a million ideas of things I wanted to do! I finally had a day where I could craft, bottle some tomatoes, or just relax. I have been wanting to organize the garage for a few weeks, but I knew I couldn’t do that without Colby’s help. I have an old wooden “eyebrow” off my Grandpa Hitchcock’s house I have started to refinish, but never had a chance to complete. And Halloween is just around the corner so I thought it would maybe be fun to make some decorations for my porch or entry way. The list of things to do went on and on and I was excited to do something for myself today. First thing on my list: get the butter out of the fridge so I can make cookies for a sweet lady I visit teach for her birthday today. About thirty minutes later while I was sitting at the table eating some cereal, my Mom called saying Mason (my sister’s little boy) was struggling to breathe and she was pretty concerned. I shoveled a few more spoonfuls of cereal in my mouth, didn’t even brush my teeth, grabbed my keys, and headed up to my sister’s house to check on him (without any shoes). Colby was home for another hour before going to work so I knew I had a few minutes to help. When I arrived, Mason was definitely struggling to breathe and his little belly proved it. He was retracting, wheezing, and coughing every once in a while. I told my mom he needed to see a doctor. I got in my van and drove back to my house to find our nebulizer. When I got back to Hilary’s house, my mom asked if I could just take Marlee home with me and she would take Mason to the hospital. Sure. No big deal. Right? I grabbed Marlee’s bag of stuff and we headed back home. The second I walked in the door I realized I had also agreed to watch my cute little neighbor boy for a few hours today. Marlee also had her first day of dancing today and I had to take Easton to pre-school! How in the world was I going to take Marlee to her first day of dancing and drop off Easton at pre-school at the same time? Would I take Marlee early and hope she didn’t scream or want me to stay? Should I ask my friend to take Easton to school? And on top of that, what was I going to do with Cohen and how was I going to be back fifteen minutes later to watch Titus? My mind raced and I figured out a plan. I would take Easton to Keisha’s house early, take Marlee to dancing while holding Cohen, change her shoes, pray she didn’t scream and want me to stay, and then race back home in time to watch Titus. After Natasha left, my eyes swelled with tears. I was more than happy to help everyone who needed it, but the day I had planned for myself quickly was not the day I had hoped it would be. Titus and Cohen played like they had been best friends forever and I was lucky enough to get some tomatoes canned before Colby picked Trevin and Easton up from school. The boys were excited as they walked through the door drinking some small sodas Colby had bought for them. 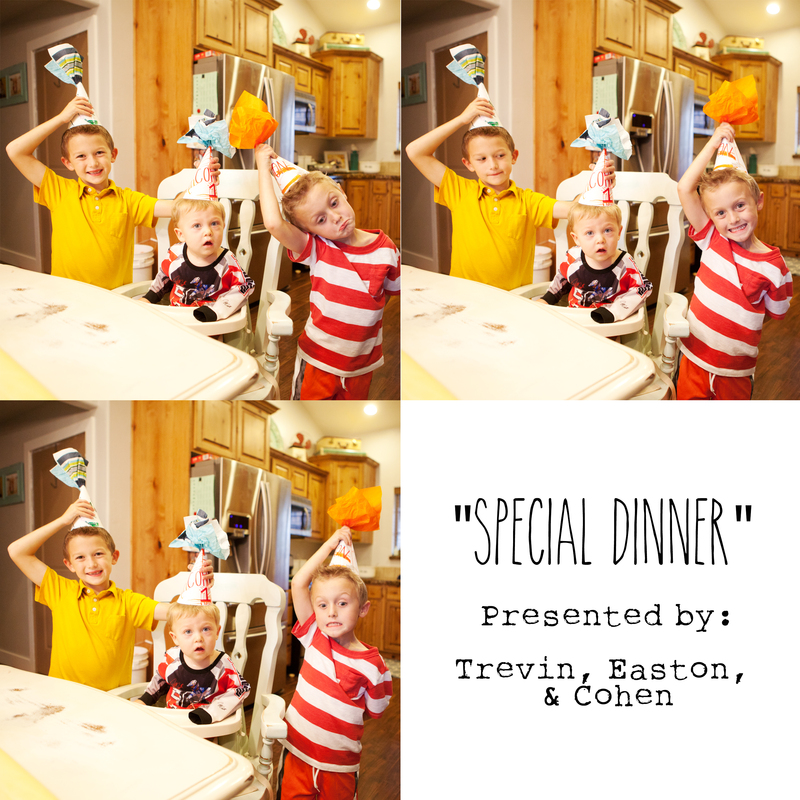 They told me a few highlights of their day and then Trevin said, “Mom can we have a special dinner tonight?” Special dinner? I wasn’t sure what he meant, but decided I would do my best. My day had been full of things to do and service to provide that it made me excited to do something exciting for my children. With no plan in place, I threw some chicken in the crock pot and told them to grab some paper and markers. Party hats seemed like something “special” for dinner. Trevin, Easton, and I sat at our kitchen table for well over an hour while Cohen took a nap. We designed party hats complete with a crumpled napkin top. 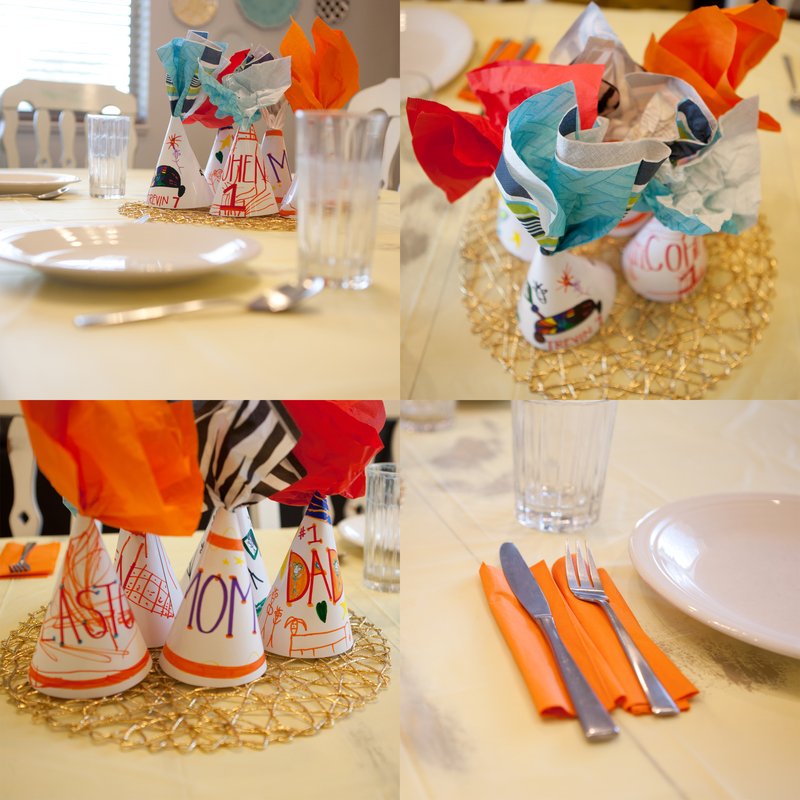 The boys put a shiny yellow table cloth on the table, the party hats as the center piece, and set the table with orange napkins at Easton’s request. It was the perfect setting in my eyes and the boys were beyond excited! I took a picture of the party hats the boys had made and sent it to Colby. I explained we would be having a “special dinner” at 7:00 tonight for family night. After the table was set and the party hats made, I had envisioned what I wanted tonight to be like…all of us gathered around the kitchen table, visiting, laughing, and enjoying dinner together. When dinner time arrived, the boys couldn’t wait to eat. They started before Colby and me and were finished eating and off playing in their room about five minutes later. I fed Cohen some rice while Colby made his plate. Cohen finished eating and Colby and I sat down together and ate dinner without the oldest boys. We talked for a minute about how our day was and what tomorrows plans were. Trevin came and wanted a picture of Colby and me in our party hats and off to their room they went again. My day didn’t go as planned and neither did my dream dinner. However, my heart was full of gratitude and love. I was grateful for the opportunity to serve my sister and my neighbor. I had enjoyed the afternoon with my boys coloring, talking, and planning a dinner they had hoped for. While cleaning up dinner, I enjoyed listening to the boys laugh with Colby in their room as he built them a train track. My heart was full. While checking Facebook a few minutes ago, Natasha had posted a Mormon Message titled You Never Know. This video totally reflected how I was feeling today. Perfectly. Sometimes in life it’s hard to recognize all the good things we do. We plan our schedules and life happens. We don’t get things done and we get upset because our “to do list” wasn’t completed like we hoped it would be. However, the Lord realizes we are trying our best and as a mother, sometimes that means realizing it’s okay to stay in our pajamas all day baking, cleaning, and being a mother. Or sometimes it’s helping others when the call to serve comes our way. …if only I could have made those cookies! Tomorrow it’s on my list of things to do! *While I was in the middle of this blog post I had to walk into Trevin & Easton’s room and remind them it was bedtime. After already telling them twice to calm down and go to bed, a few minutes later I hear Easton screaming. Trevin had thrown a toy at him and gave him a bloody nose. Just a little side note to remind myself of things that happened today.